Originally designed for ski patrols and mountain rescue, this one-size-fits-all radio harness will instantly adjust to hold any sized radio snuggly to your chest without the use of multiple Velcro straps or buckles found on lesser quality harnesses. The vertical orientation of the radio improves reception, extends antenna life, and reduces the chance of chest injury during a fall.The unique suspension system virtually guarantees that your harness will not bounce or swing. 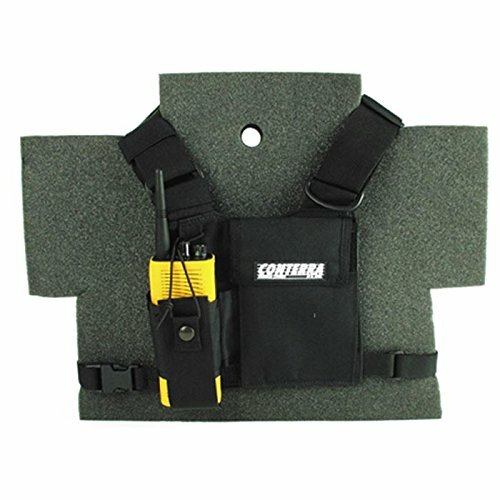 The harness features all Cordura construction, a large cargo pocket, pen pouch, and twin elastic antenna keepers. A must for SAR and MCI applications. If you have any questions about this product by Conterra, contact us by completing and submitting the form below. If you are looking for a specif part number, please include it with your message.